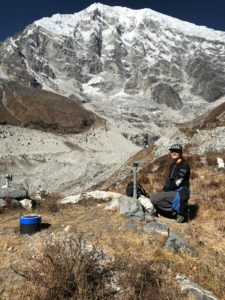 For her master thesis research Kari-Anne studied the sources of light-absorbing particles in the Langtang Valley in Nepal in the Himalaya. The study showed that most light-absorbing particles consisted of local material. When light-absorbing particles (LAPs) deposit on a glacier surface, they decrease the albedo of ice and snow, resulting in increased melt. Glaciers in high mountain areas in the Himalya are influenced by this effect. Many studies assume that the main source of the LAPs is pollution, like black carbon (BC), from the Indo-Gangetic plain. However, this is uncertain. During this study, field work, microscopic analysis and (large-scale) remote sensing images were used to determine the main source of LAPs in the study area. The results of the field work and the microscopic analysis showed that most LAPs consisted of natural sources like silicates and aluminosilicates. Only a few black carbon particles were present in the samples. The remote sensing images showed high concentrations of BC at the Indo-Gangetic plain but the concentrations for BC in the field work area were very low. These results make it very unlikely that high concentrations of LAPs at the Indo-Gangetic plain reached the study area during the field work period. Further research is needed to determine if LAP concentrations during other seasons are also dominated by local material.